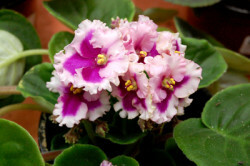 This extremely popular houseplant is relatively easy to grow and can be brought into bloom any time of the year. 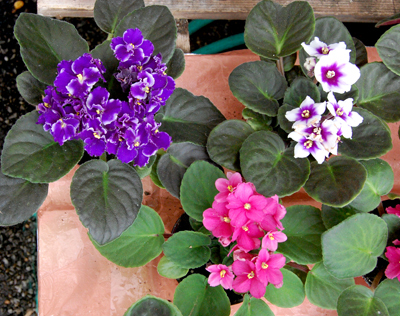 The clustered flowers are available in a wide variety of solid as well as variegated colors. 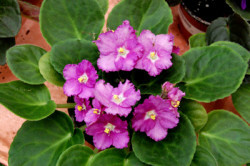 African violets have five basic needs: steady warmth, careful watering, good light, high humidity and regular feeding. Steady warmth means temperates that range from 70° to 78° during the day and from 62° to 68° at night. Night temperatures should never drop below 60°. If nights are too cool and air circulation is inadequate, botrytis (fungal disease) or powdery mildew may develop. Allow the surface of the soil to dry out between thorough waterings. Use luke-warm or room-temperature water and take care not to overwater as these plants are susceptible to crown rot. Good light is filtered, moderate-to-bright light from an east or south window in winter or from a west or window in summer — avoid direct sun. 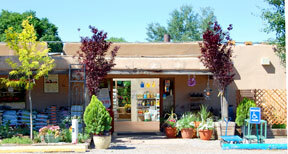 They can do well under artificial light with 12 to 18 light-hours daily. High humidity is important, but mist only when the plant is not in flower, use a very fine spray of tepid water, and keep the misted plant away from direct sun. Feed plants monthly, alternating between a mild (or diluted) balanced fertilizer and another one that has a high phosphorous content (click here to learn “How to Choose the Right Fertilizer”). Leaf stems should not come in contact with the rim of a clay pot. Use a plastic pot or place a strip of foil on the top edge of a clay pot in order to keep the stem dry. To prolong blooming, carefully remove the blossoms as they begin to fade. Distinguishing Characteristics: Relatively easy to grow and bring into bloom any time of the year.